In contrast to a standard export, Lightroom 3's Publish Services allow you to maintain an ongoing releationship between a set of uploaded images and those on the destination service. If you modify or delete any images in a published set then Lightroom will memorise this fact and, when you're ready, update or delete the corresponding images on the server. Go to the Library module. Scroll to the bottom of the left hand panels to locate the "Publish Services". 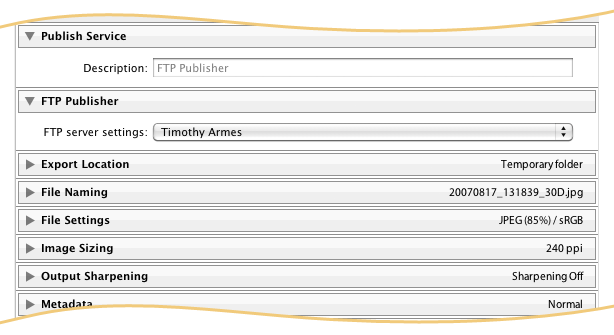 Click on "Set Up..." next to the "FTP Publisher" service. To set up the destination FTP server click on the FTP server settings menu and choose Edit... The following window opens to allow you to define your connection. If this is a server that you'll use frequently then you may save your settings as a preset from the menu at the top of the dialog. Click OK to close the dialog. Note that the path that you enter here (perhaps to your user account) will act as the parent path for the publish service. This is explained further below. You should also browse the remaining standard export panels to define how your images will be exported from Lightroom before they are uploaded to the server (eg. the file format, the size, the compression, etc). FTP Publisher allows you to create a hierarchy of published sets and collections that you wish to upload to your FTP server. These are very similar to Lightroom's standard set and collections with that exception that they cannot be moved outside of the publish service. 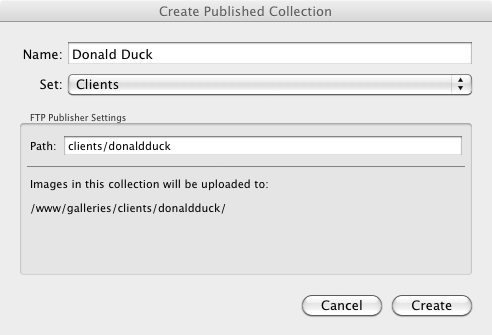 When you first create your service there will be a default collection that may be used for publishing images to the parent path that you specified when creating the service. You may rename or delete this collection if you wish. 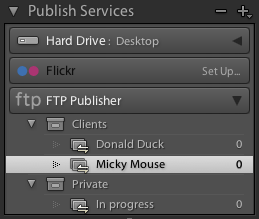 Note that FTP Publisher allows you to organise your collections however you wish to best meet your workflow - they do not reflect the folder hierarcy on the server. Within your organisation each collection must be assigned a path on the server into which the contained images will be uploaded. This path is relative to the parent path which you chose when creating the publishing service. No two collections may share the same path. To create a new published collection set or collection you should right-click on an existing one and choose the appropriate option. When creating a new collection you must supply the server path to which the images will be uploaded. To upload images to your FTP server you must first drag them into one of the collections that you have created. Remember, each collection is associated with a given path on the server. Lightroom doesn't upload until you tell it to. Newly added photos will be display in Lightrooms grid under the banner "New Photos to Publish". Press the "Publish" button (bottom left) to upload your images to the server. If the upload success then they'll be markes as published. If you delete an image from a published collection then it will be marked as "To be deleted". When you press "Publish" your images will be removed from the server. If you modify any images that have been publish then they will be marked as "To be re-published". Once again, you must manually press "Publish" to have the images uploaded.